The last time Jamian Juliano-Villani staged a show at JTT, the canvases were so big and the gallery so small that viewers had to stand outside to fully see the works: sci-fi visions of sexed-up aliens and blasted moonscapes, both menacing and irreverent, like billboard ads for the apocalypse. This time, the space is bigger, the paintings are smaller and—more importantly—sparer. The restraint that characterizes these enigmatic, economical works marks a shift for the young New Jersey native, who gained early fame for phantasmagoric mash-ups of cartoon figures stretched like Silly Putty, stock imagery, logos, and memes in lurid acrylic: David Salle–esque pastiches for the Ren & Stimpy generation. Instead of splicing everything she’s got into each canvas, it feels as though Juliano-Villani is testing how much she can strip away while still achieving the psychotropic dread of her busier works. 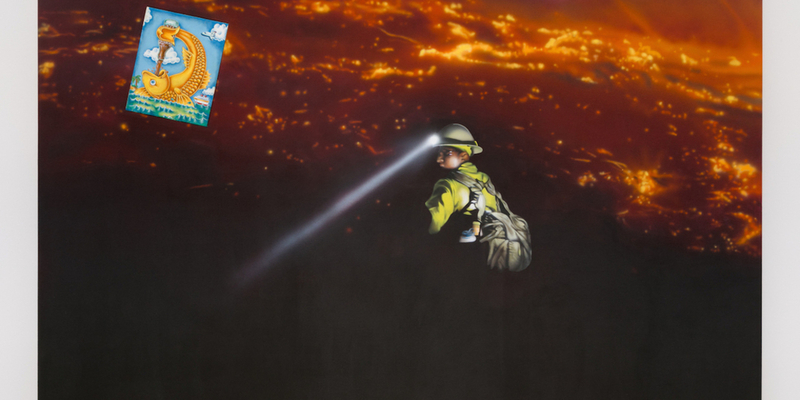 In Gone with the Wind (all works 2018), a cartoon fish gluts itself on Coca-Cola while a helpless-looking firefighter floats above burning California. October depicts an ash-choked Pompeian infant blowing across an empty school hallway. The linoleum floor is littered with shattered glass, in an eerie evocation of recent school shootings. Together, these works convey a loss of control, of entropy overriding security, idealism, and best-case scenarios. In Three Penny Opera, Juliano-Villani delivers her own late-capitalist critique: Cookie Monster, stretched to fashion-model proportions, sashays down a runway toting bulging Key Food shopping bags like so many designer duffels. One can see why the artist would relate to Brecht’s alienation effect; she too excels at rendering the familiar foreign. Lest we take these works too seriously, though, Juliano-Villani has also made an inane installation involving jokey, graffiti-covered canvases (“toys can’t hang,” reads one). The stoner humor deflects earnest engagement with the other, excellent paintings. Unnecessarily—those are plenty funny, and much more as well.